Thank you for choosing Katie Lister Photography! This page will guide you through how best to prepare for our newborn photography session, including what to expect, clothing choices, how the session will run, and choosing your final images. My newborn photography sessions take place in the early weeks after you baby arrives. There is no age limit on when I can photograph a newborn. Every week is a special one and it does not matter if your baby is one week old or 20 weeks old! Our session will be very relaxed and documentary style, so it is not essential that your baby is asleep all the time. I will guide you through the session to help you feel at ease. The session can last 2-3 hours, as we take plenty of breaks for feeds and changes whenever needed. I will take a wide variety of photographs – just baby, pairings and family groups. If you’ve got something specific in mind, please do let me know! Please don’t schedule other visitors to arrive on the day of, or during our photography session. Having a newborn baby is exhausting, if this isn’t your first you’ll know this all too well! Having photographs taken will likely be tiring enough for you and baby, without additional visitors to deal with. Worried that your older children won’t behave? Please don’t! I am experienced in working with children of all ages and know how to get the best from them. I can coax even the most reluctant of children into having fun. It is not necessary to coach or bribe your older children to smile or look at the camera – I’m looking for natural expressions and will interact directly with your children to get the best from them. I might ask for your assistance in capturing the attention of younger children, but I may also ask you to step away and let me focus on engaging directly with little ones (or older ones!). Please don’t be offended if I do this and just use it as an opportunity to relax! Clothing choices are an important part of preparing for your photography session. There are a few simple tips that you can follow to help maximise the impact of your finished images, and if you get stuck, feel free to chat to me, or look on my blog for inspiration. For baby, I recommend keeping clothing really simple – plain babygros or vests which fit as snugly as possible look best on tiny babies. If you’re purchasing something specifically for our session, buy a size which just fits now, rather than one for baby to grow into. This will avoid your baby looking swamped! I love to use your own blankets, muslins or special items to personalise your images. Please have these to hand! The aim is for your family to look coordinated, but not matching. 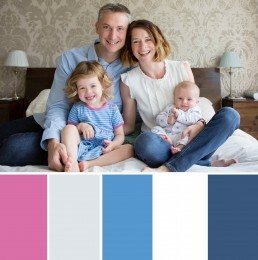 By sticking to three complementary colours, each family member will look different, but you will avoid looking too ‘busy’ (clashing colours, too many colours), or looking like one colour block (too much of the same colour). For example, choose blues, pinks or pale greens with beige or grey and a dash of white. Neutral or pale colour tones look really great in newborn photographs as it creates a soft colour pallette. Black clothing is best avoided. The same goes for your little ones – when dressing babies please keep clothing fuss-free. When I had my own newborn photography session, I splashed out on a new dress because hardly any of my existing clothes fitted in the early weeks post-baby. I also booked a blow-dry for my hair. Not only did those little things help me look nice, but it made me feel confident and happy. It’s a small cost in the grand scheme of what I invest in family photography. This isn’t essential of course, but if there’s somthing that helps you feel great, treat yourself! Please remember that I am a mother too, and totally understand what life is like with a newborn. If you manage none of the above, don’t worry… we will still capture beautiful images of your little one!